Gelastic seizures (GS) is an uncommon seizure type characterized by sudden inappropriate attacks of uncontrolled and unmotivated laugh and its diagnostic criteria were elaborated by Gascon. These criteria included stereotypical recurrence of laugh, which is unjustified by the context, associated signs compatible with seizure, and ictal or interictal abnormalities. GS can be cryptogenic or symptomatic of a variety of cerebral lesions, the most common being hypothalamic hamartoma. However, GS associated with other types of cerebral lesions are exceedingly rare. The physiopathologic mechanisms of this type of seizure are still undefined. Two reports have described a non-lesional GS arising from a parietal focus. In this paper, we report the first case of lesional GS associated to the parietal area of the brain in a child and this case has associated fever that is likely an ictal symptom. However, GS associated with other types of cerebral lesions are exceedingly rare. The physiopathologic mechanisms of this type of seizure are still undefined. Two reports have described a non-lesional GS arising from a parietal focus. In this paper we report the first case of GS lesion associated to the parietal area of the brain in a child. This case also has associated fever that is likely an ictal symptom. A 5-year-old boy was referred to our department for recurrent fever and uncontrolled epilepsy. The patient was the youngest one in a family of five children born out of a consanguineous marriage, but without any other significant familial history. He was born at full-term without any perinatal problem, and weighed 3,400g. The neuro-psychomotor development of the patient was globally normal. He walked at the age of 13 months and acquired verbal language at the age of 18 months and his first seizures occurred by the age of 14 months. These attacks were characterized by generalized tonic clonic seizures with a frequency of 1-2 times per month. He was initially treated using phenobarbital then Valproate without any significant improvement. By his 4 th year, the patient started expressing daily laughing attacks that were occurring 2-3 times a day while each was lasting for about a minute. This stereotypical laugh was unrelated to the context; the patient was generally unconscious during attacks and experienced post-ictal amnesia. Most often, an undescribed feeling occurred prior to seizure associated with left hemi-corporeal paresthesia. These seizures were associated to episodes of fever up to 39.5°C; these episodes occurred almost everyday and resolved spontaneously in less than 3 h. The fever rose with the start of gelastic attack and lasted 2-3 hours and sometimes occurred independently. The physical and neurological evaluation of the patient was essentially normal. He was 104 cm tall (50 th percentiles), weighting 17 kg (50 th percentiles) with 50 th percentiles head circumference. Complete paraclinical investigations were performed, this included C-reactive protein, sedimentation rate, leukocyte count, urinalysis, lumbar puncture, thorax radiography, cardiac and abdominal ultrasound - and were not suggestive of infection. A cerebral magnetic resonance imaging (MRI) revealed a lesion in the right parietal area, suggestive of cortical dysplasia. Functional MRI was performed using sensory tasks which showed activation in the sensory cortical area as well as in the lesion [Figure 1]. Interictal Electroencephalography (EEG) showed sporadic active spiking in the right temporal region [Figure 2]. Valproate was reintroduced without any improvement. Carbamazepine and later Clobazam were added but did not prevent seizures. Lamotrigine and vigabatrin were proposed before suggesting surgical treatment. A single patient was reported with parietal localization of the epilepsy, he was presenting veritable laughter attacks, described as inappropriate, involuntary and with contact rupture. An ictal smile arising from the parietal lobe was observed in two other patients. , Our case is probably the third one with parietal localization, and the only among the three, which is related to a cortical dysplasia. Regarding our patient, the ictal activity seems to be generated in the cortical area; both fever and GS probably resulted from hypothalamic involvement, which supports the major role of hypothalamus in the neuronal network described above. Fever might accompany the GS when it originates from cortical focus in temporal, frontal or parietal cortical areas; this could be misdiagnosed or most often underreported as a peri-ictal symptom since infection is usually thought of in such a patient. Fever should be investigated in epileptic patients in order to better assess the prevalence of this feature as a peri-ictal symptom. In the mean time, it is interesting to review all reported literature for better understanding the pathophysiological mechanisms involved in both GS and peri-ictal fever. 1. Trousseau A. De l'Epilepsie. Baillere, PARIS. Clinique medicale de l'Hotel-Dieu de Paris. Vol. 2. Edition: J B Baillière et fils, libraires de l academie impériale de medecine, paris, 1862. 2. Daly DD, Mulder DW. Gelastic epilepsy. Neurology 1957;7:189-92. 3. Gascon GG, Lombroso CT. Epileptic (gelastic) laughter. Epilepsia 1971;12:63-76. 4. Choi JU, Kim DS. Treatment modalities for intractable epilepsy in hypothalamic hamartoma. Adv Tech Stand Neurosurg 2012;39:117-30. 5. Kokkinos V, Zountsas B, Kontogiannis K, Garganis K. Epileptogenic networks in two patients with hypothalamic hamartoma. Brain Topogr 2012;25:327-31. 6. Arroyo S, Santamaría J, Sanmartí F, Lomena F, Catafau A, Casamitjana R, et al. Ictal laughter associated with paroxysmal hypothalamopituitary dysfunction. Epilepsia 1997;38:114-7. 7. Parvizi J, Le S, Foster BL, Bourgeois B, Riviello JJ, Prenger E, et al. Gelastic epilepsy and hypothalamic hamartomas: Neuroanatomical analysis of brain lesions in 100 patients. Brain 2011;134:2960-8. 8. Striano S, Santulli L, Ianniciello M, Ferretti M, Romanelli P, Striano P. The gelastic seizures-hypothalamic hamartoma syndrome: Facts, hypotheses, and perspectives. Epilepsy Behav 2012;24:7-13. 9. Pedley TA. Ictal laughter associated with paroxysmal hypothalamopituitary dysfunction. Epilepsia 1997;38:114-7. 10. Dericioglu N, Cataltepe O, Tezel GG, Saygi S. Gelastic seizures due to right temporal cortical dysplasia. Epileptic Disord 2005;7:137-41. 11. Tassinari CA, Riguzzi P, Rizzi R, Passarelli D, Volpi L. Gelastic seizures. In: Tuxhorn I, Holthausen H, Boenigk H, editors (Pp 928). Paediatric Epilepsy Syndromes and Their Surgical Treatment. London: John Libbey and Company Limited; 1997. p. 429-46. 12. Helmstaedter C, Witt JA. Multifactorial etiology of interictal behavior in frontal and temporal lobe epilepsy. Epilepsia 2012;53:1765-73. 13. McConachie NS, King MD. 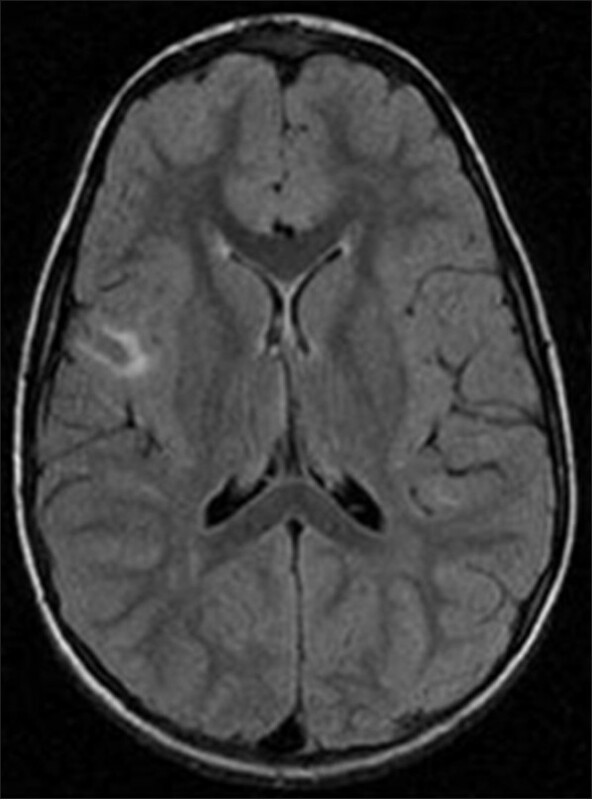 Gelastic seizures in a child with focal cortical dysplasia of the cingulate gyrus. Neuroradiology 1997;39:44-5. 14. Striano S, Barbieri F, Bilo L, Meo R, Ruosi P, Soricellis M. Recurrent frontal status epilepticus with polymorphic clinical features. A case report. Acta Neurol (Napoli) 1990;12:193-9. 15. Sartori E, Biraben A, Taussig D, Bernard AM, Scarabin JM. 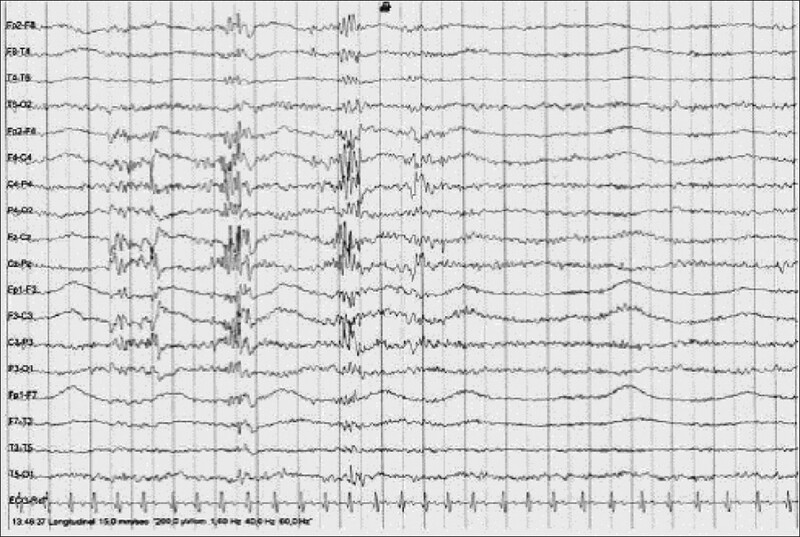 Gelastic seizures: Video-EEG and scintigraphic analysis of a case with a frontal focus; review of the literature and pathophysiological hypotheses. Epileptic Disord 1999;1:221-8. 16. Shin HY, Hong SB, Joo EY, Tae WS, Han SJ, Cho JW, et al. Gelastic seizures involving the right parietal lobe. Epileptic Disord 2006;8:209-12. 17. Satow T, Usui K, Matsuhashi M, Yamamoto J, Begum T, Shibasaki H, et al. Mirth and laughter arising from human temporal cortex. J Neurol Neurosurg Psychiatry 2003;74:1004-5. 18. Gordon BH, Lesser RP, Arroyo S. Mapping cerebral sites for emotion and emotional expression with direct cortical electrical stimulation and seizure discharges. Prog Brain Res 1996;107:617-22. 19. Sperli F, Spinelli L, Pollo C, Seeck M. Contralateral smile and laughter, but no mirth, induced by electrical stimulation of the cingulate cortex. Epilepsia 2006;47:440-3. 20. Scarella T, Macken MP, Gerard E, Schuele SU. Psychogenic gelastic seizures in a patient with hypothalamic hamartoma. Epileptic Disord 2012;14:187-9. 21. Cross JH. Fever and fever-related epilepsies. Epilepsia 2012;53:3-8. 22. Rossetti AO, Tosi C, Despland PA, Staedler C. Post-ictal fever: A rare symptom of partial seizures. Eur J Neurol 2007;14:586-90. 23. Wachtel TJ, Steele GH, Day JA. Natural history of fever following seizure. Arch Intern Med 1987;147:1153-5. 24. Leung AK, Robson WL. Febrile seizures. J Pediatr Health Care 2007;21:250-5. 25. Meo R, Bilo L, Striano S, Ruosi P, Estraneo A, Nocerino C. Transient global amnesia of epileptic origin accompanied by fever. Seizure 1995;4:311-7. 26. Leal AJ, Moreira A, Robalo C, Ribeiro C. Different electroclinical manifestations of the epilepsy associated with hamartomas connecting to the middle or posterior hypothalamus. Epilepsia 2003;44:1191-5. 27. Turrin NP, Rivest S. Innate immune reaction in response to seizures: Implications for the neuropathology associated with epilepsy. Neurobiol Dis 2004;16:321-34. 28. Henry TR, Bakay RA, Pennell PB, Epstein CM, Votaw JR. Brain blood-flow alterations induced by therapeutic vagus nerve stimulation in partial epilepsy: II. prolonged effects at high and low levels of stimulation. Epilepsia 2004;45:1064-70.